I’ve posted quite a few new blogs this week, more than I have I have recently. My posts have also been really different than they usually are, but don’t worry, the main focus of this blog will always remain the same. For example, I usually just post articles but yesterday I posted a music video along with some lyrics for In Exile by Thrice. 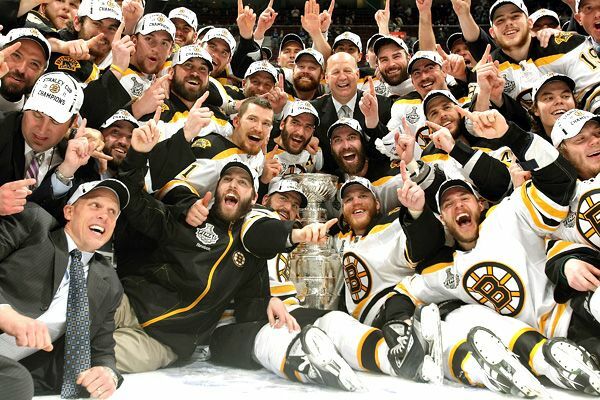 Today is going to be another odd post for this blog, it’s about my favorite hockey team, the Boston Bruins, winning the Stanley Cup last night! I became a hockey fan about 4 years ago during the 2007 – 2008 season. Before the season had started I fell in love with hockey and decided that I was going to be a Bruins fan after doing some research and looking back at history. Boston has such a rich hockey tradition and I wanted to be part of that, win or lose. I’m not really a fan of any other Massachusetts teams. I haven’t followed the NBA since the days of Michael Jordan in Chicago so I wouldn’t consider myself a Celtics fan. I don’t care for baseball, although if I did I would probably be a Red Sox fan. And as a Minnesota Vikings fan, I don’t cheer on the New England Patriots. There’s a lot of reasons why Boston winning the Stanley Cup this year is so special and important for me. Number one is obviously that my wife and I are simply huge Bruins fans. Another of course is that Boston hasn’t won a Championship since 1972…it’s been a long time coming and I believe all my fellow Bruins fans as well as the city of Boston truly deserves this. This was Mark Recchi’s last NHL game ever and his third Stanley Cup championship, what a way to go out. Tim Thomas is simply an incredible goalie, the MVP, potential Vezina Trophy winner and a true gentleman. Nathan Horton was injured in game 3 of the series and Marc Savard was already out due to an injury. The list could go on but I simply don’t have enough time to keep writing it. Another, more personal reason why this is so important to me is because since Jordan was with the Bulls, a favorite sports team of mine has never won a championship while I’ve been a fan. Although it’s nothing that I want to dwell on too long or idolize, it’s a pretty amazing feeling. Because my wife and I don’t have cable at home, we had to watch much of the playoffs at my parents’ house. They too watched with us and I’m pretty sure we made my mom, who is not a sports person at all, a hockey fan. They even watched the last few games of this final series when we weren’t there because we were able to watch them at home on NBC. As the players were celebrating we received a phone call from my mom, who was excited that Boston had just won and wanted to see how excited we were. And so another hockey season has come and gone and for a short while we Bruins fans will enjoy being at the top of the NHL. Before long we’ll be seeing new players picked up in the draft and current players changing teams. In a few shorts months the excitement and the long journey will start all over and once again we’ll be cheering on our favorite teams as they pursue the opportunity to hoist the greatest trophy in all of sports, Lord Stanley’s Cup.